Seafest favourites or easy options for Rugby Sevens too. Costume includes headpiece, shirt, vest, belt, pants and boot tops. Costume includes, hat, shirt, belt, skirt. 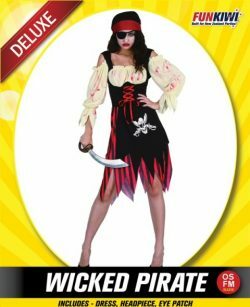 This wicked pirate costume includes dress, headpiece and eyepatch. 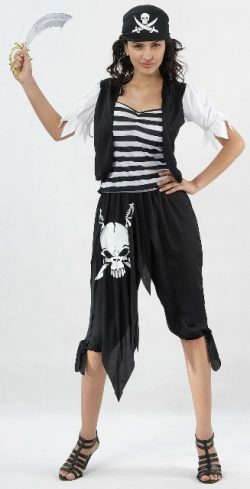 Black and white pirate girl costume top and pants. Pirate girl skirt, top, blouse and sashes. Pirate man costume pants, shirt with attached vest, belt and headgear.